With the holiday season around the corner homeowners everywhere are getting started with holiday cleaning to get things in perspective before the crazy rush begins. As part of holiday cleaning the first things most people throw away are usually damaged items or are items that no longer work. Quite often electronic waste or E-waste as it’s more commonly referred is one of the main things discarded from homes during the holidays as people look forward to purchasing the latest electronics and devices at this time. Nevertheless when it comes to the disposal of E-waste this is not something that should be taken lightly as it can have very dangerous effects when disposed in the incorrect manner. Therefore homeowners are urged to act responsibly when conducting their holiday clean up by ensuring that they discard of E- waste in the appropriate manner. Did you know that inside many electronic products like computer monitors, stereos, televisions, and refrigerators are known to consist of several, hazardous, materials? Materials such as lead, cadmium, beryllium or brominated flame retardants are all said to be contained in E-waste and can be extremely dangerous if exposed to people or the environment. Various forms of pollution, water or soil contamination, impaired cognitive function, behavioral disturbances and nervous system damage in humans can all be a result of exposure to the toxic materials contained in E-waste .This is why it‘s absolutely critical that people exercise proper E-Waste disposal or practice recycling E-Waste. 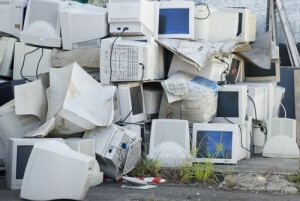 Despite the fact that most E-waste is considered unwanted many of these products are recyclable. So why not play your role in keeping the environment safe by recycling any unwanted E-waste that you may have to discard as part of your holiday cleaning. Don’t know how to recycle a stereo? No problem. In cases like this there are waste removal services that could be contracted to come in and manage this for you. Not only do they have the equipment and the trained personnel to easily and manage E-waste but they also deal with the transport and processing of E-waste with no hassle to you. Utilizing this approach provides a more eco-friendly alternative to E-waste disposal and it helps to prevent any major, health, issues, reduces pollution and greenhouse gas emissions into the atmosphere. Need Help With Holiday Cleanup And E- Waste Disposal? Junk King Is Here To Help! Looking for professional help with all your holiday junk removal? Junk King is here to give you a hand as we specialize in the removal of all types of waste including E-waste inclusive of transport and processing . So be responsible this holiday season and promote safe E-waste disposal these practices play a vital role in keeping the environment clean and the general population safe. To get your E-Waste removed visit our website at www.junk-king.com to book online or call us at 1-888-888-JUNK to schedule an appointment right away. This entry was posted in Uncategorized and tagged e-waste, foreclosure clean-outs, junk hauling, junk hauling companies on October 17, 2017 by Julian Torres, "JT". Last updated November 7, 2017 .